After years of marriage to a man who refused to eat anything but conventional (read mundane, boring, uninteresting) food, it is wonderful being with a man who can appreciate life’s simple pleasures and find enjoyment in liver, kidneys, tongue, and other meats which were once considered choice cuts to be savored on a rare occasion when available, namely butchering time. 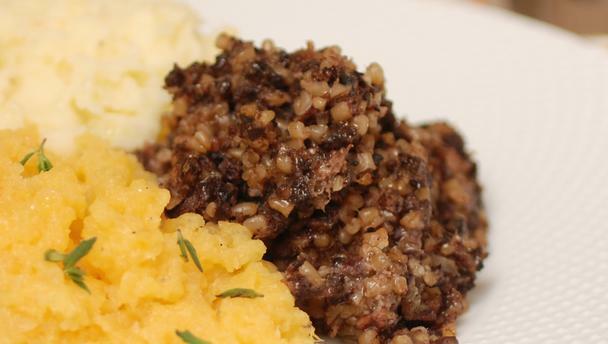 I use a traditional Scottish recipe for making haggis and take the time to toast the oatmeal just so before steaming the pudding for hours over a slowly simmering pot of water. By the time it’s finished the house is filled with the aroma of liver and seasonings. I spent a summer and other shorter stents in Scotland where haggis appears in every form imagineable from burgers to panini, so I’m well aware of what the texture, flavor, and aroma should be. I use a slightly less traditional recipe for pate, but the results are to die for. It is creamy, flavorful, and when I put it out as an appetizer we ended up making it the meal while the left over beef stroganoff sat untouched. That’s a pretty good indication we found it worthy of placement in my personal recipe collection. I’d like to share a photo with my readers, however, we finished it off before it occurred to me to take one. For those who appreciate liver, and possibly to entice a few who aren’t sure whether it’s worthy of sampling or not, I’ll share the recipe. A nice cheese, crackers or toast, and if you’re a drinker, perhaps a glass of wine are the only accompaniments you’ll need. INGREDIENTS: 3 tablespoons butter, approximately 1 lb. of chicken livers (rinsed and well drained), 2 hard-boiled eggs (peeled and coarsely chopped), half an 8 oz. package of cream cheese (preferably at room temp. – if you wish to moderate the taste of the liver you could use the entire package quite successfully), 2 tablespoons of finely minced fresh parsley, 1 tablespoon finely minced fresh thyme, salt and pepper to taste, a generous dash of onion powder. You could easily replace the onion powder with slightly browned finely minced onion. METHOD: Melt the butter in a heavy skillet and add the chicken livers. Cook over medium heat about 5 minutes until done but do not allow to cook long enough to get tough. Stir occasionally. Drain well. Put the livers and all other ingredients into a food processor and process until creamy. Refrigerate several hours or overnight before serving. Sunday we hopped onto the bike and headed toward Eufaula, Alabama to see the historic homes and businesses there and about 40 miles out we stopped at a little dive called Jerry’s Country Cooking for lunch. The home-made cinnamon rolls we’d devoured for breakfast had carried us about as far as could be expected and when we got into Union Springs we began to look for an eatery. Jerry’s building is simple and humble giving no hint as to the quality of food that awaited us inside. I took the two steaming plates to a booth while Martin went to get our teas. When he got to the table he also possessed two cups containing what the server told him were our desserts. I took a quick peek and saw that the cups contained peach cobbler. After only a couple of bites we agreed Jerry was an amazing cook, one of those old Southern cooks who was born with a knack for seasoning food just so. We were more sure of that fact with each bite. Finally when we were beginning to worry we’d be so full we’d doze off riding along on the bike we couldn’t resist opening the cups of cobbler. With the first bite our eyes met across the table and we both went, “Mmmmmm”. This was no run of the mill peach cobbler. It was delicious, right down to the last bite. I considered licking the cup for the last hint of golden peachy goodness but the arrival of our host at the table to ask if we’d enjoyed our meal brought me to my senses. Mr. Jerry Baxley was as congenial as his food was delicious and after telling him how much we had enjoyed our lunch and discussing the merits of good Southern food we exchanged business cards and Martin and I saddled up for the last leg of our journey. Should you find yourself anywhere in the vicinity of Union Springs I highly encourage you to join the locals at Jerry’s for an unforgetable meal and a helping of real Southern hospitality the way it used to be. No need to dress up, if we were entertained as warmly as we were while dressed in biker’s leathers, you can’t go wrong with jeans and a comfortable T-shirt. I’ll be here trying to tweak my peach cobbler recipe. Part of the excitement and enjoyment of motorcycle riding is looking for some obscure little mom and pop eatery along the route. We avoide chain restaurants like the black plague, looking instead for a clean (the cleaner the better) but informal establishment where we can sample local favorites. Sometimes brilliant cooks are housed in the most unprepossessing building imaginable, and diners willing to give them a chance to impress us with their culinary flare can be very pleasantly surprised with the quality of food available. Saturday on the way to the Victory dealership in Pelham, AL we stopped at Golden Rule Barbecue where we found the atmosphere relaxing with old photos on the wall to entertain us and good Southern barbecue on our plates. The stuffed baked potato was really good, but should have been served at a much higher temperature. The barbecue sauce was good and the sweet tea (and unsweet) flowed freely. I think the original proprietors would be pleased at how the Golden Rule prepares its signature dish and how the customers receive it.